Saturday. Cloudy skies with a few sunny breaks, but no rain. And certainly no snow or ice as was the case in the east. I put on wellies, gardening gloves, and my old fleece jacket. Garden cleanup was the sole task on my list for the day. 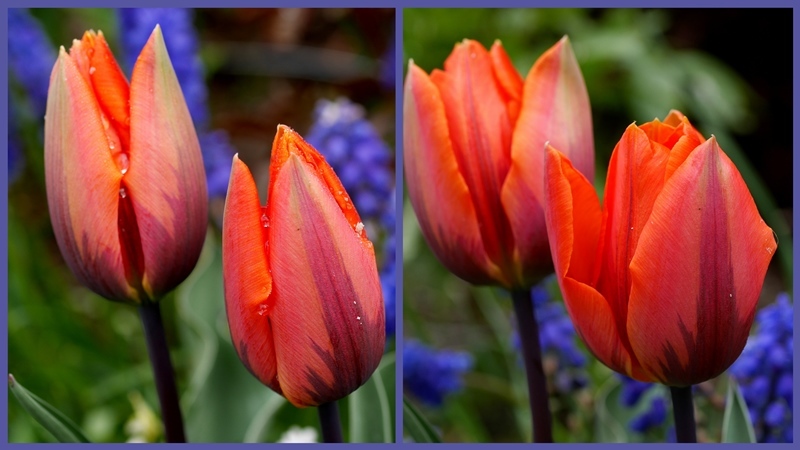 In the morning I snapped the tulips on the left; a few hours later, the same tulips on the right, opening to the faint sun. The last of the winter garden vegetables. Kale was beginning to go to seed, and the carrots were becoming a bit hairy, but everything tastes just fine. Tim spread compost after I weeded and cleaned out the bed; he helped with the last bit of weeding, too. My fingers were sore from all the pulling. After a hot shower I relaxed with a cup of tea, a piece of chocolate, and a new Country Living (UK). Small treats like this are a fine reward for a day of hard work. Of course, looking out the window and seeing the garden beds tidied is in itself, also a reward. 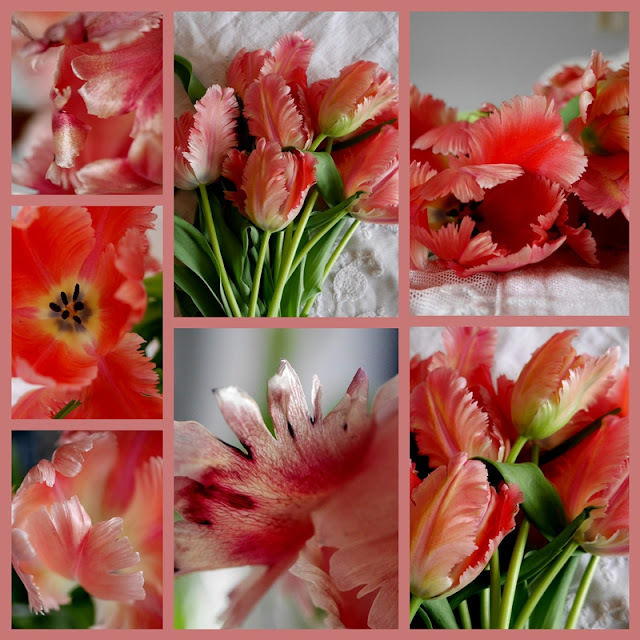 The "novelty" tulips purchased a week or more ago are aging beautifully: petals curling slightly, colours intensifying, and texture becoming silky. Do you like dates? The edible kind, I mean. On Sunday afternoon I made an Easy Date Cake and then a cream and caramel sauce to go alongside. How good it was warm from the oven. 1. Grease and flour a 13 x 9 inch baking dish. Preheat the oven to 350 degrees F.
2. Pour the boiling water over the chopped dates. Add the baking soda and let cool for 15 minutes or so. 3. In a mixer, beat the butter until creamy, add the sugars and beat well. Add the vanilla. 4. Stir in the date mixture. The batter will look quite thin and watery. 5. Add the flour and stir well. Pour into the prepared baking pan. Bake for 35 - 40 minutes. In a small saucepan, over medium heat, whisk the egg yolk, brown sugar, water, and butter until melted and smooth; bring to a boil while whisking continually; boil one minute. Add the salt, vanilla, and cream. Heat but don't boil. One more garden beauty - the first Centaurea Montana popped out over the weekend. Isn't she a beauty? Linking to Mosaic Monday, hosted by Maggie of Normandy Life. Amazing tulips! Isn't it so good to see things coming into flower now. How wonderful to be able to work out in the garden, a sure sign that Spring has finally arrived. I was impressed with your Winter veggies. The date cake looks amazing and would be a wonderful addition to afternoon tea. the oven, and meant to be served warm, would be a special treat worthy of Christmas. for a crisis of faith. ☺️ Thank you for providing news of spring! It looks like a perfect weekend, in my opinion. We've been doing the same and this week it's time to put in the vegetables. Any time after 15 April it seems safe to do it. I am sure that it is a great reward to see your tidied garden beds and the beautiful things that are growing now. And a little chocolate and tea and a good magazine . . . well, that's a fine reward too! Ahhhh . . . spring pleasures! I always love to see your photos, Lorrie. Sounds like a good weekend. Your gardening weekend looks like a satisfying weekend to my way of thinking. Your tulips are so pretty and how nice to be rewarded with fresh vegetables. Oh my, that date cake looks delicious and so moist. I have never had a date cake. It looks like I may be missing out. Thanks for providing the recipe. How wonderful that you got to go out into the garden! Your tulips are pretty. I hope to get out in my yard this coming weekend. Those tulips (both groupings) are stunners! I do like dates and your cake recipe looks awesome. Happy Monday! Wow that date cake sounds and looks amazing! The blue flower is very exotic! WOW! I love this pretty color. It's hard to believe you are so far North but have flowers already! I need a new magazine! lol Hugs! You always show such delicious looking things to eat - I really enjoy dates, and this cake looks particularly appetising and very moist. We survived the 2-day ice storm! It rained all day today so it's very slushy outside. Since we won't be seeing any pretty flowers for while, I'll have to enjoy the ones you share on your blog! The date cake looks oh so good. How I wish I had some right now. The perfect day is tulips, tea, and a good magazine for sure. How lovely! the tulips are so gorgeous, beautifully intense colors. Glad you had a lovely day gardening. Lorrie, Winter vegetables - what an idea. The carrots looks delicious. The tulips are wonderful color. Thanks for sharing and have a great week. Sylvia D.
What a beautiful post! I just discovered your blog an am enjoying it very much. Must make the date cake, looks so yummy. The novelty tulips are just gorgeous! Eye candy...don't know what I love more the flowers or the date cake! I'm so behind in visiting but soon I'll be back fresh when all this listing, selling and moving is behind us. Blessings! Lorrie - the first tulip mosaic caught my eye with the 'veins' of purple rising from the base of the flower .... And I like hairy carrots, 'cause you know they were raised naturally! My hubby loves dates (and I like them, too), so I will add this luscious-looking dessert to our list of cooking-together recipes! Enjoy the rest of your week! Thank you for your comment on my post. I have now learned that in its northern range, the stoat adopts a completely white coat (save for the black tail-tip) during the winter period. In summer, the fur is sandy-brown on the back and head, and white below. Happy spring! Yours is very beautiful. Your gardening weekend looks and sounds wonderful. The tulips are so pretty and home grown vegetables are just so tasty. I am catching up with you this morning and as always you are delighting my heart. Your lovely words and stuninng photography are a balm to my soul. Thank you for commenting. Each comment is a connection between us. I read each one and will usually visit your blog in return. If you are a no-reply blogger, then I will not be able to respond to you directly. If you have a Google+ blog, I am unable to comment there. Lorrie Orr 2012. Simple theme. Powered by Blogger.